Transmission electron micrograph of Wolbachia within an insect cell. In biological classification, class is a taxonomic rank, as well as a taxonomic unit, a taxon, in that rank. Other well-known ranks in descending order of size are life, domain, kingdom, phylum, order, family, genus, and species, with class fitting between phylum and order. As for the other well-known ranks, there is the option of an immediately lower rank, indicated by the prefix sub-: subclass. For example, dogs are in the class Mammalia. The Alphaproteobacteria is a diverse taxon and comprises several phototrophic genera, several genera metabolising C1-compounds (e.g., Methylobacteriumspp. ), symbionts of plants (e.g., Rhizobium spp. 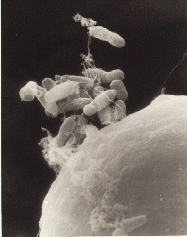 ), endosymbionts of arthropods ( Wolbachia ) and intracellular pathogens (e.g. Rickettsia ). Moreover, the class includes (as an extinct member) the protomitochondrion, the bacterium that was engulfed by the eukaryotic ancestor and gave rise to the mitochondria, which are organelles in eukaryotic cells (See endosymbiotic theory). A species of technological interest is Rhizobium radiobacter (formerly Agrobacterium tumefaciens): scientists often use this species to transfer foreign DNA into plant genomes. Aerobic anoxygenic phototrophic bacteria, such as Pelagibacter ubique , are alphaproteobacteria that are a widely distributed and may constitute over 10% of the open ocean microbial community. 2S (GSB)] they can be also called as lithotrophs, and so, some photoautotrophs are also called photolithoautotrophs. Examples of phototroph organisms: Rhodobacter capsulatus, Chromatium, Chlorobium etc. Rhizobium is a genus of Gram-negative soil bacteria that fix nitrogen. Rhizobium species form an endosymbiotic nitrogen-fixing association with roots of legumes and Parasponia. a taxonomic unit, a taxon, in that rank. In that case the plural is orders. Convergent evolution is the independent evolution of similar features in species of different lineages. Convergent evolution creates analogous structures that have similar form or function but were not present in the last common ancestor of those groups. The cladistic term for the same phenomenon is homoplasy. The recurrent evolution of flight is a classic example, as flying insects, birds, pterosaurs, and bats have independently evolved the useful capacity of flight. Functionally similar features that have arisen through convergent evolution are analogous, whereas homologous structures or traits have a common origin but can have dissimilar functions. Bird, bat, and pterosaur wings are analogous structures, but their forelimbs are homologous, sharing an ancestral state despite serving different functions. Ribosomal ribonucleic acid (rRNA) is the RNA component of the ribosome, and is essential for protein synthesis in all living organisms. It constitutes the predominant material within the ribosome, which is approximately 60% rRNA and 40% protein by weight, or 3/5 of ribosome mass. Ribosomes contain two major rRNAs and 50 or more proteins. The ribosomal RNAs form two subunits, the large subunit (LSU) and small subunit (SSU). The LSU rRNA acts as a ribozyme, catalyzing peptide bond formation. The SSU and LSU rRNA sequences are widely used for working out evolutionary relationships among organisms, since they are of ancient origin and are found in all known forms of life. The Class Alphaproteobacteria is divided into three subclasses Magnetococcidae, Rickettsidae and Caulobacteridae. The basal group is Magnetococcidae, which is composed by a large diversity of magnetotactic bacteria, but only one is described, Magnetococcus marinus. 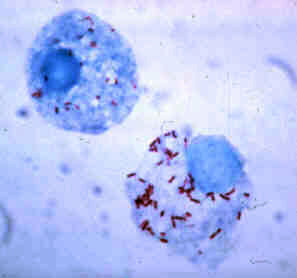 The Rickettsidae is composed of the intracellular Rickettsiales and the free-living Pelagibacterales. The Caulobacteridae is composed of the Holosporales, Rhodospirillales, Sphingomonadales, Rhodobacterales, Caulobacterales, Kiloniellales, Kordiimonadales, Parvularculales and Sneathiellales. In phylogenetics, basal is the direction of the base of a rooted phylogenetic tree or cladogram. The term may be more strictly applied only to nodes adjacent to the root, or more loosely applied to nodes regarded as being close to the root. Each node in the tree corresponds to a clade; i.e., clade C may be described as basal within a larger clade D if its root is directly linked to the root of D. The terms deep-branching or early-branching are similar in meaning. Magnetotactic bacteria are a polyphyletic group of bacteria that orient themselves along the magnetic field lines of Earth's magnetic field. Discovered in 1963 by Salvatore Bellini and rediscovered in 1975 by Richard Blakmore, this alignment is believed to aid these organisms in reaching regions of optimal oxygen concentration. To perform this task, these bacteria have organelles called magnetosomes that contain magnetic crystals. The biological phenomenon of microorganisms tending to move in response to the environment's magnetic characteristics is known as magnetotaxis. In contrast to the magnetoreception of animals, the bacteria contain fixed magnets that force the bacteria into alignment—even dead cells are dragged into alignment, just like a compass needle. Comparative analyses of the sequenced genomes have also led to discovery of many conserved insertion-deletions (indels) in widely distributed proteins and whole proteins (i.e. signature proteins) that are distinctive characteristics of either all Alphaproteobacteria, or their different main orders (viz. Rhizobiales, Rhodobacterales, Rhodospirillales, Rickettsiales, Sphingomonadales and Caulobacterales) and families (viz. Rickettsiaceae, Anaplasmataceae, Rhodospirillaceae, Acetobacteraceae, Bradyrhiozobiaceae, Brucellaceae and Bartonellaceae). Whole genome sequencing is ostensibly the process of determining the complete DNA sequence of an organism's genome at a single time. This entails sequencing all of an organism's chromosomal DNA as well as DNA contained in the mitochondria and, for plants, in the chloroplast. 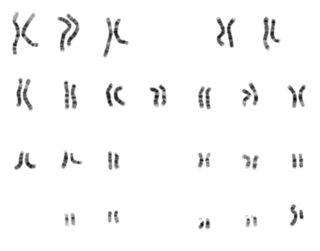 In practice, genome sequences that are nearly complete are also called whole genome sequences. In evolutionary biology, conserved sequences are identical or similar sequences in nucleic acids or proteins across species, or within a genome, or between donor and receptor taxa. Conservation indicates that a sequence has been maintained by natural selection. Indel is a molecular biology term for an insertion or deletion of bases in the genome of an organism. It is classified among small genetic variations, measuring from 1 to 10 000 base pairs in length, including insertion and deletion events that may be separated by many years, and may not be related to each other in any way. A microindel is defined as an indel that results in a net change of 1 to 50 nucleotides. Although only a few studies have been reported on natural genetic transformation in the Alphaproteobacteria, this process has been described in Agrobacterium tumefaciens ,  Methylobacterium organophilum ,  and Bradyrhizobium japonicum . Natural genetic transformation is a sexual process involving DNA transfer from one bacterial cell to another through the intervening medium, and the integration of the donor sequence into the recipient genome by homologous recombination. Deinococcus–Thermus is a phylum of bacteria that are highly resistant to environmental hazards, also known as extremophiles. These bacteria have thick cell walls that give them gram-positive stains, but they include a second membrane and so are closer in structure to those of gram-negative bacteria. Cavalier-Smith calls this clade Hadobacteria. 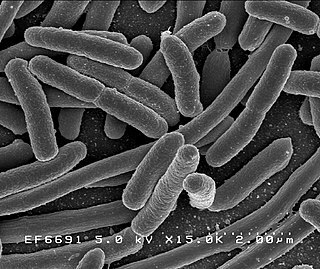 Acidobacteria is a phylum of bacteria. Its members are physiologically diverse and ubiquitous, especially in soils, but are under-represented in culture. Agrobacterium tumefaciens is the causal agent of crown gall disease in over 140 species of eudicots. It is a rod-shaped, Gram-negative soil bacterium. Symptoms are caused by the insertion of a small segment of DNA, from a plasmid, into the plant cell, which is incorporated at a semi-random location into the plant genome. Agrobacterium is a genus of Gram-negative bacteria established by H. J. Conn that uses horizontal gene transfer to cause tumors in plants. Agrobacterium tumefaciens is the most commonly studied species in this genus. Agrobacterium is well known for its ability to transfer DNA between itself and plants, and for this reason it has become an important tool for genetic engineering. The Rhizobiaceae is a family of proteobacteria comprising multiple subgroups that enhance and hinder plant development. Some bacteria found in the family are used for plant nutrition and collectively make up the rhizobia. Other bacteria such as Agrobacterium tumefaciens and A. rhizogenes severely alter the development of plants in their ability to induce crown galls or hairy roots found on the stem. The family has been of an interest to scientists for centuries in their ability to associate with plants and modify plant development. The Rhizobiaceae are, like all Proteobacteria, Gram-negative. They are aerobic, and the cells are usually rod-shaped. Many species of the Rhizobiaceae are diazotrophs which are able to fix nitrogen and are symbiotic with plant roots. The SAM-II riboswitch is a RNA element found predominantly in alpha-proteobacteria that binds S-adenosyl methionine (SAM). Its structure and sequence appear to be unrelated to the SAM riboswitch found in Gram-positive bacteria. This SAM riboswitch is located upstream of the metA and metC genes in Agrobacterium tumefaciens, and other methionine and SAM biosynthesis genes in other alpha-proteobacteria. Like the other SAM riboswitch, it probably functions to turn off expression of these genes in response to elevated SAM levels. A significant variant of SAM-II riboswitches was found in Pelagibacter ubique and related marine bacteria and called SAM-V. Also, like many structured RNAs, SAM-II riboswitches can tolerate long loops between their stems. There are several models of the Branching order of bacterial phyla, one of these was proposed in 1987 paper by Carl Woese. Allorhizobium vitis is a plant pathogen that infects grapevines. 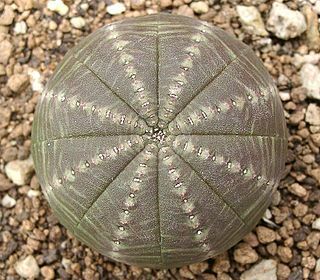 The species is best known for causing a tumor known as crown gall disease. One of the virulent strains, A. vitis S4, is responsible both for crown gall on grapevines and for inducing a hypersensitive response in other plant species. Grapevines that have been affected by crown gall disease produce fewer grapes than unaffected plants. Though not all strains of A. vitis are tumorigenic, most strains can damage plant hosts. Genomic streamlining is a theory in evolutionary biology and microbial ecology that suggests that there is a reproductive benefit to prokaryotes having a smaller genome size with less non-coding DNA and fewer non-essential genes. There is a lot of variation in prokaryotic genome size, with the smallest free-living cell's genome being roughly ten times smaller than the largest prokaryote. Two of the bacterial taxa with the smallest genomes are Prochlorococcus and Pelagibacter ubique, both highly abundant marine bacteria commonly found in oligotrophic regions. Similar reduced genomes have been found in uncultured marine bacteria, suggesting that genomic streamlining is a common feature of bacterioplankton. This theory is typically used with reference to free-living organisms in oligotrophic environments. ↑ Grote J, Thrash JC, Huggett MJ, Landry ZC, Carini P, Giovannoni SJ, Rappé MS (2012). "Streamlining and core genome conservation among highly divergent members of the SAR11 clade". mBio. 3 (5): e00252–12. doi:10.1128/mBio.00252-12. PMC 3448164 . PMID 22991429. 1 2 3 4 5 6 7 8 Ferla MP, Thrash JC, Giovannoni SJ, Patrick WM (2013). "New rRNA gene-based phylogenies of the Alphaproteobacteria provide perspective on major groups, mitochondrial ancestry and phylogenetic instability". PLOS ONE. 8 (12): e83383. doi:10.1371/journal.pone.0083383. PMC 3859672 . PMID 24349502. 1 2 Brenner, Don J.; Krieg, Noel R.; Staley, James T. (July 26, 2005) [1984(Williams & Wilkins)]. George M. Garrity, ed. The Proteobacteria. Bergey's Manual of Systematic Bacteriology. 2C (2nd ed.). New York: Springer. p. 1388. ISBN 978-0-387-24145-6. British Library no. GBA561951. 1 2 J.P. Euzéby. "Alphaproteobacteria". List of Prokaryotic names with Standing in Nomenclature (LPSN). Archived from the original on 2013-01-27. Retrieved 2011-11-17. ↑ Chilton MD, Drummond MH, Merio DJ, Sciaky D, Montoya AL, Gordon MP, Nester EW (1977). "Stable incorporation of plasmid DNA into higher plant cells: the molecular basis of crown gall tumorigenesis". Cell. 11 (2): 263–71. doi:10.1016/0092-8674(77)90043-5. PMID 890735. ↑ Rodríguez-Ezpeleta N, Embley TM (2012). "The SAR11 group of alpha-proteobacteria is not related to the origin of mitochondria". PLOS ONE. 7 (1): e30520. doi:10.1371/journal.pone.0030520. PMC 3264578 . PMID 22291975. ↑ Viklund J, Ettema TJ, Andersson SG (Feb 2012). "Independent genome reduction and phylogenetic reclassification of the oceanic SAR11 clade". Mol Biol Evol. 29 (2): 599–615. doi:10.1093/molbev/msr203. PMID 21900598. ↑ Viklund J, Martijn J, Ettema TJ, Andersson SG (2013). "Comparative and phylogenomic evidence that the alphaproteobacterium HIMB59 is not a member of the oceanic SAR11 clade". PLOS ONE. 8 (11): e78858. doi:10.1371/journal.pone.0078858. PMC 3815206 . PMID 24223857. ↑ Georgiades K, Madoui MA, Le P, Robert C, Raoult D (2011). "Phylogenomic analysis of Odyssella thessalonicensis fortifies the common origin of Rickettsiales, Pelagibacter ubique and Reclimonas americana mitochondrion". PLOS ONE. 6 (9): e24857. doi:10.1371/journal.pone.0024857. PMC 3177885 . PMID 21957463. ↑ Thrash JC, Boyd A, Huggett MJ, Grote J, Carini P, Yoder RJ, Robbertse B, Spatafora JW, Rappé MS, Giovannoni SJ (2011). "Phylogenomic evidence for a common ancestor of mitochondria and the SAR11 clade". Sci Rep. 1: 13. doi:10.1038/srep00013. PMC 3216501 . PMID 22355532. ↑ Williams KP, Sobral BW, Dickerman AW (July 2007). "A robust species tree for the alphaproteobacteria". Journal of Bacteriology. 189 (13): 4578–86. doi:10.1128/JB.00269-07. PMC 1913456 . PMID 17483224. ↑ Gupta RS (2005). "Protein signatures distinctive of Alphaproteobacteria and its subgroups and a model for Alpha proteobacterial evolution". Crit Rev Microbiol. 31 (2): 135. doi:10.1080/10408410590922393. PMID 15986834. ↑ Gupta R.S. (2000). "Phylogeny of Proteobacteria: Relationships to other eubacterial phyla and to eukaryotes". FEMS Microbiol. Rev. 24 (4): 367–402. doi:10.1111/j.1574-6976.2000.tb00547.x. PMID 10978543. ↑ Gupta R.S. ; Sneath P.H.A. (2007). "Application of the Character compatibility approach to generalized molecular sequence data: Branching order of the Proteobacterial subdivisions". J. Mol. Evol. 64 (1): 90–100. doi:10.1007/s00239-006-0082-2. PMID 17160641. ↑ Sayers; et al. "Alphaproteobacteria". National Center for Biotechnology Information (NCBI) taxonomy database. Retrieved 2011-06-05. ↑ 'The All-Species Living Tree' Project. "16S rRNA-based LTP release 106 (full tree)" (PDF). Silva Comprehensive Ribosomal RNA Database . Retrieved 2011-11-17. ↑ Demanèche S, Kay E, Gourbière F, Simonet P (2001). "Natural transformation of Pseudomonas fluorescens and Agrobacterium tumefaciens in soil". Appl. Environ. Microbiol. 67 (6): 2617–21. doi:10.1128/AEM.67.6.2617-2621.2001. PMC 92915 . PMID 11375171. ↑ O'Connor M, Wopat A, Hanson RS (1977). "Genetic transformation in Methylobacterium organophilum". J. Gen. Microbiol. 98 (1): 265–72. doi:10.1099/00221287-98-1-265. PMID 401866. ↑ Raina JL, Modi VV (1972). "Deoxyribonucleate binding and transformation in Rhizobium jpaonicum". J. Bacteriol. 111 (2): 356–60. PMC 251290 . PMID 4538250. Bacterial (Prokaryotic) Phylogeny Webpage: Alpha Proteobacteria.